A London-based company called Technology Will Save Us has created a DIY videogame console. While Microsoft and Sony are attempting to cram as much power as possible into the Xbox One and PlayStation 4--within reason, of course. These things need to be somewhat affordable--a small, London-based company called Technology Will Save Us is doing the opposite. However, what the company's new console lacks in processing power, it makes up for in elbow grease. The DIY Gamer Kit is an extremely low tech system that turns the owner into a console manufacturer. After purchasing the package, gamers will need to roll up their sleeves and construct the unit before flipping the power switch. "We tried to go back to the archetype of a gaming device," said product designer Michail Vanis in a recent interview with Edge. "The screen only has 64 pixels and no colours; the buttons are just the classic up, down, left, right and start; and the sound is a monotone speaker. We were really inspired by those keyring-sized Game & Watches Nintendo used to make, because [they] stripped everything complicated for a really simple gaming experience." 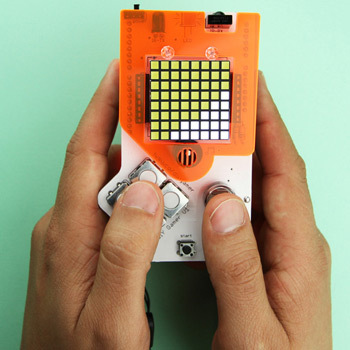 The kit is made up of 40 pieces, and you'll need to be proficient with a soldering iron. But once the project is complete, you should have some understanding about the inner workings of a gaming console. Then it will be time to start programming your first videogame. The DIY Gamer Kit costs about $82, and U.S. customers should plan on a 14-day turnaround for international shipping.